This preserve is owned and managed by the Royal River Conservation Trust with two separate trailheads, one at 74 Dougherty Road, and the other at 161 North Pownal Road, both in New Gloucester. The preserve includes old quarries, distinct and varied ledges, mixed forests, and beautiful ground cover of lichen and mosses. The ridgeline offers winter-time views, including beautiful sunsets and moonrises. 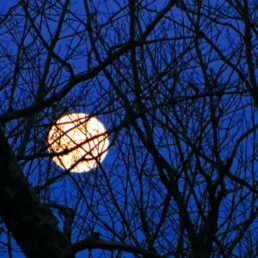 Every winter we invite you to join us on our annual full moon trek. The northern-most section of the preserve near the powerline includes a large wetland complex with several beaver ponds, significant vernal pools, and rich habitat. Most visitors explore this preserve on the trails that begin at the trailhead at 74 Dougherty Road. 74 Dougherty Road: A 1.2 mile loop trail begins at a trailhead at 74 Dougherty Road in New Gloucester; the trailhead parking lot is off-road and plowed in winter. This primitive trail with rocks and roots includes one stream crossing and a few short steep ledges that require some agility. The trail is ideal for trekking or snowshoes with minor elevation gain. The trailhead on Dougherty Road (also known as Chadsey Road in Pownal) is 0.5 miles south of Route 231 (Intervale Road) on the left. Or from Allen Road in Pownal, follow Chadsey Road (becomes Dougherty Road) for 0.8 miles, and look for the trailhead and four car parking lot. 161 North Pownal Road: A short trail spur and trailhead at 161 North Pownal Road is primarily designed to get off-trail enthusiasts including hunters and foragers across the powerline and onto the large undeveloped parcel; it is also a quiet trail for a short on-trail hike, or for convenient access to a mossy picnic ledge, beaver pond, and vernal pools. Parking is on the road shoulder. The new trail follows a private residential driveway for 50 feet before turning right onto RRCT’s trail corridor. The primitive narrow trail includes ledges, roots, and rocks. CMP construction on the powerline (see map) is planned for 2020 or later. Sweetser & Allen Roads: Backcountry access to the Pisgah Hill Preserve exists across a Town of Pownal woodlot with frontage on both Sweetser and Allen Roads in Pownal. Please respect neighbors if you explore this undeveloped access point for hunting or other reasons. 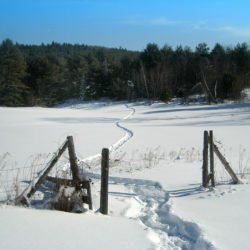 The preserve is open for hiking, snowshoeing, and backcountry skiing on or off trail. Bikes are not allowed due to trail and bridge construction standards. Equestrian use is by permission only, respecting the capacity and conditions of the land; stream crossings, stream approaches, and parking lots are not built for equestrian use. Dogs are welcome, but on leash or voice control, with strict attention to pet waste removal. Due to deer wintering, we ask that dogs be on leash during periods of deep snow; deer struggle to maintain energy during the winter; dogs and humans cause them to expend this precious energy. Tenting and camping is allowed, but with permission, and well-away from trailheads or neighbors. There are no good sources of water on the preserve, and no privies. Give us a call, and plan on strict adherence to “leave no trace” principles. NARROW BRIDGE: The hikers’ bridge over Quarry Brook near the 74 Dougherty Road trailhead requires some agility; it is a narrow temporary aluminum bridge with a hand rail. Please use caution, especially after heavy snow or heavy rain events. We have plans to replace this bridge in 2019 or later. POWERLINE CONSTRUCTION: Powerline reconstruction off North Pownal Road is expected in 2020 or later. Please look for updates and information and respect any construction postings. RRCT is the landowner of the preserve, while abutting parcels are owned by private landowners who donated conservation easements to RRCT, and by the Town of Pownal. With the support of many donors and funding sources RRCT acquired or placed conservation easements on 195 acres between 2010 and 2016. Combined with an adjacent 94-acre parcel owned by the Town of Pownal, the preserve is part of a public landscape of nearly 300 acres. More additions are in the works for later years. This project sets the stage for even more trail links and loops and the potential to protect a larger block of undeveloped habitat, possibly connecting to the Bradbury-Pineland Corridor in the future. Stewardship of the preserve includes annual monitoring of conservation easements, trail construction and maintenance, winter plowing, habitat enhancements including wood duck boxes, and more. The preserve frequently hosts group trips and school trips for hiking, nature walks, vernal pool observations, and more. Contact RRCT staff if you’d like help organizing a group or school trip. Funding for acquisition and capital improvements has come from RRCT members, private donors, the Land for Maine’s Future program, the Maine Outdoor Heritage Fund, the Casco Bay Estuary Partnership, the Recreational Trails Program (Maine BPL), the Maine Natural Resources Conservation Program (MaineDEP), charitable donations of land, and more. Large resilient unfragmented habitat block: While the preserve’s public landscape is nearly 300 acres, Pisgah Hill falls in the context of one of Cumberland County’s larger unfragmented habitat blocks. The Pisgah Hill forested block is connected across a few rural roads and conserved farms to even larger conservation priorities areas including Runaround Pond, the New Gloucester Intervale, Bradbury Mountain, and Pineland. All together, this area is identified by The Nature Conservancy and others as a priority for conservation due to predicted climate resilience (large undeveloped forests with varied geography) and wildlife. At the center of the triangle between Portland, Lewiston, and Brunswick, this green forested corner of New Gloucester, Pownal, and Durham remains rural due to strong conservation partnerships and private landowner stewardship. Ledges and forests: The preserve was assembled from more than six (so far) wood lots and separate ownerships. Generally, the southern part of the preserve has older forests with poor soils and rocky ledges, and the northern part of the preserve was harvested early in the 21st century, with good soils and many old logging roads supporting resilient forests. The preserve has surprisingly few invasive plants, due to its healthy native forests. One small pine plantation next to the Dougherty Road parking lot is the exception, with a small monoculture that invites invasive plants. Quarry Brook & beavers: Quarry Brook is the small tributary stream that begins near North Pownal Road, feeds beaver ponds and wetland complexes, and then continues through the Preserve to Dougherty Road toward Chandler Brook — the so-called Middle Branch of the Royal River. In the preserve, Quarry Brook has a widely changing size from rainstorm to rainstorm, season to season, or depending upon beaver activity. As the preserve grows with new acquisitions, the preserve protects an increasing percentage of the subwatershed of the upper reaches of Quarry Brook. Deer travel corridor and other habitat: The eastern banks of Quarry Brook are the rough location of forested corridor; the lower elevations are more popular for deer than the rocky ridge line. 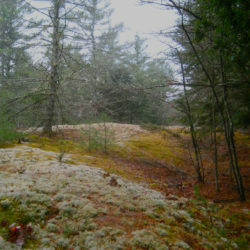 Notable ledge outcrops and other slopes and old trees provide dens or good habitat for other mammals especially fox and porcupines. Beavers regularly dam Quarry Brook. Bear and moose occasionally pass through the forests on some years. Turkey, wood ducks, turtles, and many other species are regular residents of the Preserve. RRCT installed wood duck boxes in the beaver flowage in 2017 with the help of Ducks Unlimited, supporting productive nests in 2018 and beyond. Old quarries: Various small quarries on the Pisgah Hill Preserve helped build farm foundations and other structures in the eighteenth and nineteenth centuries. In many cases, the quarries were merely good places to harvest ledge outcrops. The loop trail off Dougherty Road crosses one of the quarries — look for numerous scattered granite blocks left behind under ledges. Lichens and mosses: The ledges along the Dougherty Road loop trail are covered with fragile but beautiful lichens, mosses, lady slippers, and ferns. Please stay on the trail to help protect these sensitive plants. Significant Vernal Pools: In 2014, Maine DEP issued a determination that vernal pools near the beaver ponds off North Pownal Road are significant and critical terrestrial habitat. (Pool ID #2200). These vernal pools are identified breeding ground for Wood Frogs and Spotted Salamanders.